We are back! And how! 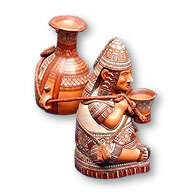 In this newsletter we will tell you the ins and outs of travelling in Peru. Great stories of great people that share their experiences in this beautiful country. This edition also offers practical information like what to bring on your trip and how to use the Boleto Turístico. Don't miss out on our discounted trips to Machu Picchu during Christmas or New Years' Eve. There is an even bigger discount if you send us the right answer to our prize question. And for the culturally interested reader you will find a good read about the home of the potato: Peru! What is it with the Boleto turístico in Cusco? Thought you were all organized after having bought your plane ticket and booked a place to stay? Wrong! Coming to Cusco means visiting a lot of ruins and museums. First thing you should do upon exploring the town is buy a Boleto Turistico to get access to most of these sites. Without the intention to do so, this backpacker ended up adopting a stray dog. After meeting this dog in the streets of Colombia, she couldn't leave him behind. When her travels continued, she decided to take him with her. Together they went on a great adventure. Yes, you packed your bag and you have your ticket and passport ready. The most important stuff has been dealt with. There may be some things that you didn't think of though. To make your trip as comfortable as possible make sure you bring the following 5 items. It is one of the most common foods in the world: the potato. So many dishes contain this tasty crop that a world without them is unthinkable. But there is more to it than just a good bite. The potato has a history and it all starts in Peru! The Qeswachaka bridge is well worth a visit. It's not just any bridge. Is is built in the original Inca manner made from a special woven grass. 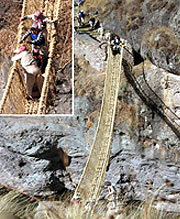 The material and construction techniques have been passed down from generation to generation since the first bridge was built in the 15th century. A trip to Queswachaka will not only show you the bridge, you will also pass by four famous lakes and typical villages such as Piñipampa, where we can appreciate an artisan tails factory and a farm fish. Join our travel community and a world of adventure awaits you!